I'm excited for this review for a particular reason, the BB Cream I'm reviewing was sent to me from Traci! I'm going to start this review off pretty straight forward, this BB Cream makes Maybelline's BB cream look like shiitake mushrooms. Claim: "Primes to smooth skin's texture; perfects to hide imperfections; hydrates for all-day moisture; corrects skin for a healthy-looking, even complexion. 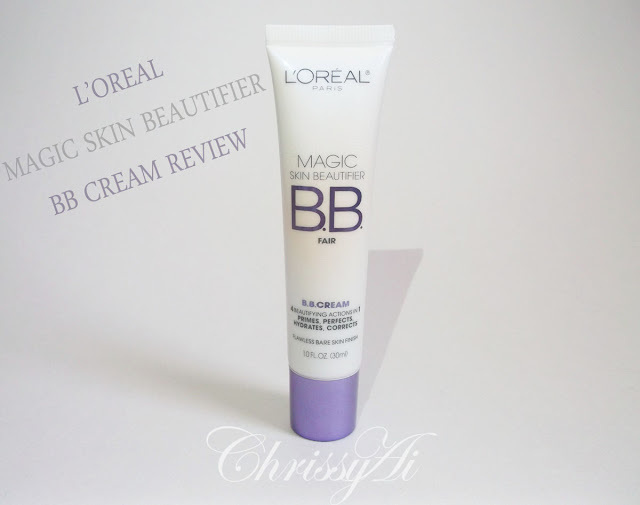 L'Oreal Paris Magic Skin Beautifier B.B. Cream instantly transforms to your perfect shade for a flawless bare-skin finish. Over time, you get more beautiful skin. Four beautifying actions in one, flawless bare-skin finish, dermatologist tested, helps protect against pore clogging." Packaging: The packaging is nothing spectacular.. I really don't expect it to be. It does look pretty as far as packaging appearance, however. It is a squeeze tube applicator with a twist off cap. Scent: This BB Cream has a slight scent. Nothing overwhelming at all, basically smells like lotion. It's not something I even notice when I apply it. Coverage: The coverage of this BB Cream is light. It actually looks like nothing is going on at all (I guess it matches that well) but it does help to cover minor skin problems. I have some acne marks and it does a decent job at covering some and others it reduces the appearance of, not completely however. It does cover enough to the point where I feel pretty comfortable and don't worry about foundation too much. I really love wearing this with concealer on my lazy days when I want to cover up without the whole routine. It looks natural and works great. Texture: This BB Cream has a bit of a "grainy" texture to it. It comes out white and contains encapsulated pigments that start to 'burst' as you rub it in. The lotion part of this BB Cream claims to contain antioxidants vitamins C and E.
I especially like that I hardly have to use any at all. I really only have to use about the size dot you see in the picture above where I blended it out in the series of pictures. I think I'll do a comparison post about the two BB creams! Please keep in mind my reviews are done based on my experience, opinion, and how it works with my skin type. The results I get may not be the same as the results you get/have gotten. I rated this product based on how well it performs as a BB Cream according to my standards. I'd really appreciate if you guys could comment below with some FAQ/Q&A questions. I want to make a section to answer questions for new readers on my blog. Even if it's a question you know the answer to, leave it, leave a list if you want! What do you usually want to know about a blogger/blog? Please let me know some questions, I'd really appreciate it! What do you do outside the blogging world? You had me sold at "bursting encapsulated capsules"! That sounds so cool! As for my questions, what do you want to be when you grow up? What are you going to do after high school? Haha! Of course I did! I wasn't sure how to word it, bursting might be a tad bit too exciting. I'm so not sold on the BB creams. I like the moisturizer that I make.. I don't want anything else moisturizing my face haha. What led you to do online home schooling? Do you like it? What other hobbies do you have? What is your typical nail care routine (since you know I'm totally in love with your friggin nails!)? I've been wanting to try this for ages, but i'm just way to happy with my garnier bb cream for oilz skin (the new one). I'm not that happy with the one from maybelline either. about questions: what do you do when blogging inspiration fails or you have less time and you have to live the blog aside...how do you handle that or what do you do to avoid it. I'd say if you're happy with it, don't bother! (: It suits my needs and did what I expected so I'm happy, though I wouldn't say it's a miracle product or anything. I love this B.B cream too!! its amazing.. The fact that it comes out so white would probably make me not want to buy it, say if I saw it in a commercial or something, but It does look like it blends in well. Thanks so much for this review. I really like to read about what others have to say about products. Its so helpful. I found you on the blog hop! Hop to me if you have a chance. Please keep doing reviews! I like this cream enough that I wear it even though it causes total breakouts. The fair color is light enough for my pale skin and I can use it without concealer or foundation. I only use it once in a blue moon when I want my skin to look amazing because the pimples the day after are pretty nasty.